Toronto Dogs Directory: Weekly Roundup - Kids In The Dog Park, A Bar For Dogs, And Therapy Squirrels! Weekly Roundup - Kids In The Dog Park, A Bar For Dogs, And Therapy Squirrels! Recently a three year old girl was viscously attacked by a large dog in a Mississauga dog park (the event happened a couple weeks ago but I haven't gotten around to discussing it). In light of the tragedy several city council councillors are calling for a ban on kids in dog parks. Brampton for instance, already has a ban on children under 10 years of age from entering a leash free zone. Several people have voiced objection to such a ban and to them I'll simply say, "You are out of your doggone mind!". CHILDREN SHOULD NOT BE ALLOWED IN LEASH FREE DOG ZONES. It doesn't matter how good your child is with dogs, nor does it matter how closely you are paying attention to your kids. Dogs are pack animals and within that pack (keep in mind I once counted over 60 dogs in one off leash Toronto park....that's quite the pack!) some can be quite rough (and clumsy!) when they are socializing, not to mention the not uncommon bursts of aggressive and/or protective behaviour that can arise within the pack. One might say, "Well if a dog is aggressive or clumsy it shouldn't be in a dog park." Here's the thing : Any perfectly behaved dog can get overly excited in a park filled with other dogs, and nobody can guarantee the manner in which a particular dog will react in a given situation. You know who else can be unpredictable/aggressive/clumsy/protective when surrounded by dozens of their own kind? KIDS! So let's make a deal. Let's agree that dog parks are specifically designed for dogs just as kid parks are specifically designed for kids. I'll keep my dogs out of the kid park as long as you keep your kids out of the dog park. OK? OK! 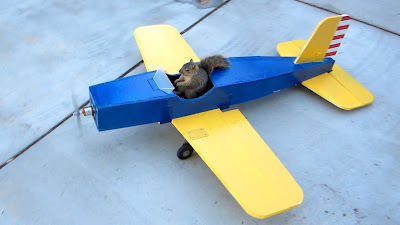 This week police had to remove a woman from a flight after she refused to get off the plane with her therapy squirrel. Yes, you read that correctly. I think we can all agree therapy pets provide an invaluable resource in our world. That being said what's next, Therapy Africanized Bees? I'm sorry but this is all kinds of ridiculous, and I have no doubt that soon enough legislation will have to be passed to determine acceptable emotional support animal. The woman claims to have informed the airline she had a therapy, "pet", she simply forgot to tell them it was in fact, a squirrel, which by the way is not an approved therapy animal. Oh, and the squirrel wasn't in a crate. And she delayed the flight by two hours. And she took a squirrel on a plane. While our city has at least 30 dog friendly licensed establishments, I believe Black Lab Brewing is the first Brewery to cater to canines. The establishment in Leslieville opened over the Thanksgiving weekend, and you can find out more on the bar's Facebook page. The brewery has a tasting room, private party room, retail and bottle shop, and a coming soon patio. Really though, I was sold dogs and beer! That's it for this week! Remember you can always join the discussion on the Toronto Pet Daily Facebook page!